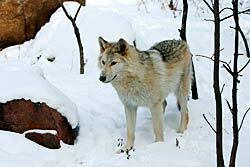 Gray Wolves — viewable in Wolf Woods in the Minnesota Trail. For the first time in many years, the Zoo will be home to a pair of northern gray wolves, viewed in their native woodland setting from a variety of perspectives, including a rustic log cabin set right in the center of the exhibit. This male was born in 19 April 1996 in Green Bay Wisconsin at the Bay Beach Wildlife Sanctuary. 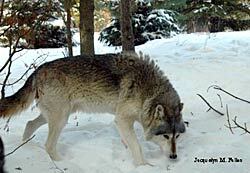 He was housed with his 3 brothers and was the most dominant male in the pack until he was suddenly outed and was transferred to MN Zoo in December 2006. It turned out his loss of dominant status was probably due to some fractured teeth that became infected. Shortly after coming to the MN Zoo he was introduced to female 11791 and was very submissive to her to the point that he would not eat if she was not there. The keepers had to target train them so that they could be close so that he would eat and to keep her from taking his food. Since moving to the new exhibit he has become more assertive and will defend his food and enrichment from the female, but she is still dominant over him. Overall he has a laid back temperament and generally stays in the middle of the exhibit, keeping him viewable to the zoo's visitors. Waziyata (Waz-e-yata) is the Lakota word for North. She was born on 29 April 2008 at Bear Creek Wildlife Sanctuary in Canada. She was born to a litter of seven. Five of her siblings are still together at the Red River Zoo in Fargo, ND and one female was sent Oregon Zoo with our former female "Shania" for company. Wazi was introduced to our male during the last week of October 2008 and they have been getting along well with no fighting observed between them. The male has taken to laying on the large boulder in the middle of the exhibit, and Wazi is usually close by, often trying to get the male to play with her. Wazi has a laid back temperament and has been doing well on exhibit and working with the zookeepers.